I'm so tired of blogging about segulot after almost 7 years of covering this ridiculous segula followed by the next abuse, that when the latest guarantee hit my email box, I barely noticed. I saved the email just in case I got back on the blogging train, but it didn't phase me much. 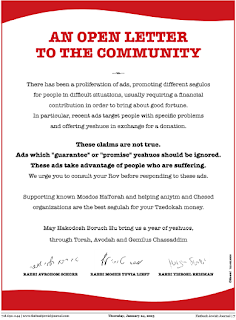 In fact, the only reason I returned to the email this morning is that the Partial View and Kallah Magazine informed me that Rosh Yeshiva have made an announcement that this is an abuse, a desecration and if anyone pledged, they can rescind their pledge I figured I'd post it. The original text of the email is below. You can see a Hebrew letter of condemnation at TPV signed by Roshei Yeshiva. I hope this is sign that times are a changin'. But, I'm fairly certain that this sort of snake oil is par for the course and the outcry won't make much of a change in the scheme of things after a decade of more and more of this. Let's hope I'm totally and completely wrong! If you – or anyone you know – desperately needs a shidduch (to find your soul-mate) – your time is LESS THAN A MONTH AWAY! There are 5 reasons why good, deserving men and women like you are locked in a prison of loneliness, desperate, as their best years slip away like grains of sand between their fingers. Any one (or more) of the above reasons is enough to keep you from ever getting married and starting a family. Without removing these reasons you simply cannot move ahead – and each and every one of them will be removed this Tu Bishvat, Motzoei Shabbos, January 26th. On this day, the Adm”or, the Rabbi Abuchatzeira, shlit”a, the illustrious miracle-worker son of holy Baba Chaki, nephew of the holy Baba Sali, may the memory of tzaddikim protect us, will conduct the special Kabalistic rectification “Tikkun 1,000 Shofaros” for the removal of any – or all! – of the five reasons that are blocking the path to happy, complete Jewish life for people like you. The holy tzadik revealed that, according to Kabbalah, the rare and uniqueTikkun 1,000 Shofaros, performed at the gravesite of the saintly Tanna, Rabbi Yonasan ben Uziel, is the complete tikkun for people blocked from getting married. The tikkun, performed with kavanos (Kabbalah meditations and divinations) of the holy Ariz”l and the Rasha”sh, is the total rectification even for people who could not be helped by anything before! In addition 257 people who participate in the tikkun will also receive FREE a special package of segulos; amulets (kamei’os) and proven Kabbalah remedies for them to find favor in the eyes of others, protect them from present and future Ayin Hara, and open their path to an easy, quick and successful shidduch (match). The Adm”or Abuchatzeira shlit”a will perform the tikkun praying at the gravesite of Rabbi Yonasan ben Uziel along with 1,000 shofar-carrying Jews who will circle the gravesite, blowing the shofar with the kavanos(intentions) of the Rashash. The holy Rabbi Abuchatzeira will bring with him a list of the people registered to participate in the tikkun. He will look at your name and that of your mother, know from it the nature of the exact obstacle that is blocking your mazel, and pray for you personallyby name. Please be aware that just 257 “match sets” were prepared by the Rabbis and Kabbalists of the Yeshiva Yeshuos B’Amuka. In view of the many people clamoring to participate, those packages will be given away FREE to people who register on a first come-first serve basis ONLY. Don’t miss out. My only comment is that one should not feel the need to consult a Rov. One should simply not give to any such "Charity". I could not agree more. The quickest way to smoke this out is not to give to groups that abuse our holy Torah, abuse desperate people, and make a mockery. 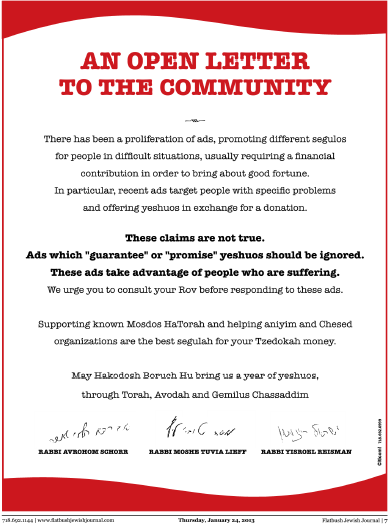 There are plenty of groups who don't engage in this that tzedakah can be redirected to. With all the years of Jewish Education that the average consumer of such ads has, theses ads, screaming phone calls, etc should have reached deaf (if not outraged or protesting) ears many years prior. The reaction from such ads should have been visceral disgust. "The reaction from such ads should have been visceral disgust." That is what I have heard from some (including close relatives). I took a different track and treated the calls no differently than if a Muslim or Scientology "Charity" had called. Hooray for Rabbis Schorr, Reisman and Lieff. Interesting though that an ad calling for boys to get married younger (yes, THAT will solve the shiduch crisis!) gets dozens of signatures and this one only gets three. Nevertheless, it is a start. The Rov in my shul says the only think we know about a mekubal taht is true is that it has the letters Mem, Kuf, Bais, Lamed - spelling out 'mekabel' as in "accepting" as in $$$. I have a problem with many of the ads out there that may not promise anything but hint in very strong language that if they give, they will get. I have read many ads from Kollel Chatzos that say, "become a partner and experience miracles!" "Next time I will contact Kollel Chatzos first and save myself a lot of ...aggravation...". I have the ad in front of me and it said that exactly. Not that they will daven for you. But that you will get what you want. Even sometimes Kupat Hair's ads come very close to skirting the line of propriety. They send out huge packets that state all the miracles people experienced due to donating money, implying that the same will happen just because you give. Not that you are paying for someone's time to daven/learn on your behalf and that is what helps. This is desecrating the holy Torah and making a mockery of it. Saying that just by paying money you can circumvent any gezeira or issue. What about bitachon? Knowing the gezeira might be for a reason? Let's just say for argument's sake that a person gives to this cause and then feels so confident that he will get married this year, that he manages to charm the next girl that he dates and she agrees to marry him. It's like the kid who passes the math test when he puts on his "magic" thinking cap. In general, these are desperate people playing on the desperation of other people but it could be good psychology. Rosie, I sure do remember listening to Shmuel Kunda's "Magical Yarmulke" tape in my car with the kids, back in the day! Thanks for the memories! I've seen ads suggesting that one's giving will solve one's problems with the IRS or justice system. I remember the days when I was broke and depressed.I wrote out my own segula that read "Soos V'Rachem Aleinu,and took it to the race track.Wouldn't you know it,my horse came in on a 17 to 1 shot.Then I realized that if I added 17 and 1 (i graduated Y.U.,after all),I had the magic number "18".Since then, I have been playing the ponies.On Wednesday night,I'll be sharing my segula with my Gambler's Anonymous Meeting...Just thought you'd like to know. in that case a horse race joke: This Irish Guy has a dream - his gf tells him bet on anything with a HAT in the name. he goes to the races and in the first race a horse called "HATS OFF" is running. he bets and wins. Second race: DERBY MAN; he bets and wins. This goes on race after race - last race he takes his entire wad and puts in on a horse called "Chatue" and LOSES. He goes home and his wife tells him - "idiot; Chateau means HOUSE; CHAPEAU is a HAT! which horse won the last race?" and he says "some japanese horse names yarmulka". If you want a real segulah, then grab a copy of Sefer Pele Yoetz [a famous mussar sefer] and star reading Perek Segulah; notice that the author never mentions amulets. I came across your site http://orthonomics.blogspot.com/ while searching Google for blogs talking about growing/gardening equipment and related keywords and was wondering if you'd be open to doing a sponsored blog post.